Car buyers in China may have to wait decades before Toyota Motor Corp. begins producing Lexus luxury cars locally, as the world's largest automaker wagers they'll favor made-in-Japan vehicles as a guarantee of quality. While BMW, Mercedes-Benz and Audi all manufacture in China, Lexus has stuck to shipping finished models from Japan, incurring import taxes that make its offerings more costly. The brand remains a holdout from building locally despite indications of significant improvement in China's auto manufacturing credentials. 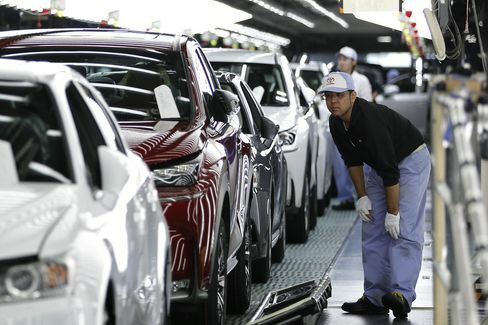 "There's too much quality risk in China to produce there," Takashi Yamamoto, executive vice president of Lexus International and an engineer who's worked at Toyota for 33 years. The company also still has to improve the brand's awareness and standing among consumers. "When that difficulty is gone, maybe local production is likely to be launched in China, maybe several decades later," he said. As long as Lexus continues to resist building vehicles in China, it prolongs pricing disadvantages relative to locally produced German luxury cars. Import duties help push up the starting price of the Lexus IS sedan to about 369,000 yuan ($58,200). That's a premium of about 30 percent over BMW's 3-Series, and 35 percent more than Audi's A4, according to auto-pricing website Autohome. Toyota rose 1.4 percent to 7,482 yen at 9:51 a.m. in Tokyo trading, matching the gain for the benchmark Topix index. 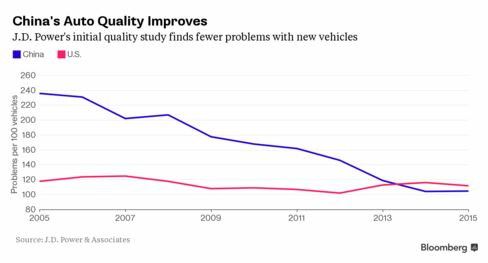 The hesitation by Lexus contrasts with data that show the quality of vehicles made in China has improved over the years to rival those in developed markets. Standards have risen as international automakers set up plants in the country and shared expertise and manufacturing processes with their local joint venture partners. The 5 Series cars produced at BMW's plant in Shenyang in northeastern China have won top ranking in J.D. Power & Associates' quality award for the past four years. The same plant has also helped a South African factory raise efficiency and reduce defect rates at its paint shop. New-vehicle owners reported105 poblems per 100 vehicles in J.D. Power's China initial quality study, released last week. The number of problems reported has fallen from 168 in 2010, and was lower than the 112 industry average for the U.S. market this year. "It doesn't necessarily mean that China vehicles have better quality, but it shows the competitiveness of the China-produced vehicles," Geoff Broderick, an automotive analyst for J.D. Power, wrote in an e-mail. More experienced production line workers, increased automation and more use of standardized quality-control processes have improved the quality of vehicles built in China, he said. Lexus has long prided itself for home-grown craftsmanship, with artisans on Japan assembly lines donning white gloves and honing years of factory experience before being entrusted to handle final inspections. Toyota's view that quality can be better controlled from its home market contributed to the 26-year lag between Lexus first beginning sales in the U.S. and starting production in the country. Toyota's Kentucky factory began assembling Lexus ES sedans last month, joining a plant in Ontario, Canada, as the luxury brand's only production sites outside Japan. "Americans and Canadians have a tradition, a history of building and manufacturing automobiles, so mentality-wise we have some common ground," Yamamoto, 57, said in an interview last week at the Tokyo Motor Show. "Chinese people, their history of building automobiles is rather short, so it's so difficult to locally build a high-quality car there." Higher prices have held back Lexus sales in a market that has been a source of explosive growth for BMW AG, Volkswagen AG's Audi and Daimler AG's Mercedes-Benz. While Lexus set an annual global sales record of 583,000 vehicles last year, less than 15 percent of deliveries were in China. BMW sold more vehicles in China than Lexus did worldwide in 2014. Exposure to China's auto market has been a detriment to some automakers' share prices this year, as slower sales growth has led some companies to discount their vehicles. Lexus can better control its pricing by importing than the German companies producing millions of vehicles in China, Yamamoto said. "Made-in-Japan guarantees quality," he said. "If you shift to made-in-China, there could be some peripheral issues accompanied with this."